Coupon Mama: So I have to ask...people in public say yes, but let me see what you say. So I have to ask...people in public say yes, but let me see what you say. I am about to pick up a few Market Tote Bags and would like to know if I get some would you want to buy them for your REUSABLE bags and PICNIC baskets..and if you did would you want Coupon Mama on the bag or what exactly would you want on the bag? Some have double arm and some single all can be embroidered!! I am thinking maybe your name on one side and Coupon Mama on the other?? How much you willing to pay for these totes? Fill up this handy basket, and when you're done, fold it flat! It is shaped like a picnic basket, but it can also be used to carry anything you need when you're on the go! 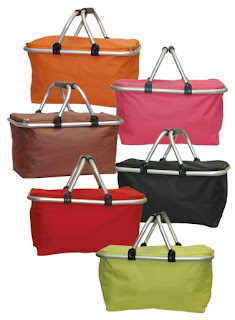 Made of durable Canvas with lightweight aluminum frame, rubber handles and zippered top. Folds flat for storage. I really like those!! Pretty pretty! What about "I'm a fan of Coupon Mama! w/ "SHOP,SAVE, SHARE" on the reverse so people know there's a purpose? I keep my sheet in the front of my binder and when someone asks me about it I show them and they usually write it down. How about Coupon Mama Protege on one side and your name on the other?